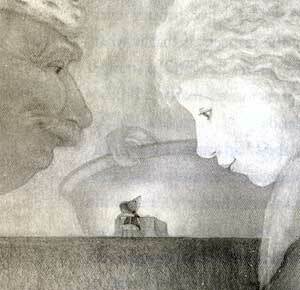 The three main characters- the mouse, rat and servant girl – refuse to fit into the place allotted to them by birth. They don’t make a concious decision to rebel but in each case, a pivotal event infects them with longing for something that they should not want. “Give him small comforts” shouted a voice at the top of the stairs, and a red cloth was thrown into the light. The cloth hung suspended for a moment, bright red and glowing, and then the door was slammed shut again and the light disappeared and the cloth fell to the floor. Forgiveness, reader, is, I think, something very much like hope and love – a powerful, wonderful thing. And a ridiculous thing, too. Isn’t it ridiculous, after all, to think that a son could forgive his father for beating the drum that sent him to his death? Isn’t it ridiculous to think that a mouse could ever forgive anyone such perfidy? And he said those words because he sensed that it was the only way to save his own heart,to stop it from breaking in two. 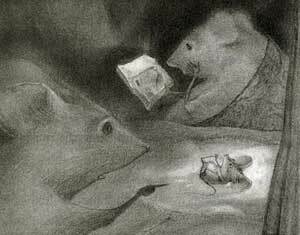 Despereaux, reader, spoke to save himself. Another theme that of stories and story telling. Despereaux learns that there is no such thing as happy ever after – but he also learns that this does not mean that stories are lies. Do you remember when Despereaux was in the dungeon, cupped in Gregory the jailer’s hand, whispering a story in the old man’s ear? I would like it very much if you thought of me as a mouse telling you a story, this story, with the whole of my heart, whispering it in your ear in order to save myself from the darkness and to save you from the darkness too. 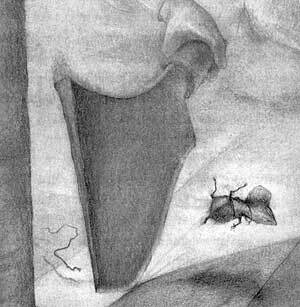 “Stories are light” Gregory the jailer told Despereaux. Reader, I hope you have found some light here. I didn’t expect it to be so dark either. But you’re right, it is a very hopeful book. You’re making me want to read it again. I wonder what I would have made of it if I had read it when I was a child. As it is, I found the description of Midge being hit about the ears until she went deaf particularly disturbing. I love this book so much, its the most beautiful book I’ve ever read. And yes i agree, this book is very dark and sullen, just making the end result that much more beautiful.